Israeli fire officials reported on Sunday morning that the enormous Carmel Mountain wildfire was more under control than it had been at any point since it began last Thursday, but stressed that it would take at least another two or three days until all the fires were extinguished. More than 30 firefighting aircraft from across Europe and even the US took to the skies Sunday morning to continue battling Israel’s worst fire ever. Among the aircraft was the Evergreen Supertanker, a privately-owned American firefighting plane that has been used to great effect over the past year to bring fires in California and other locations under control. Prime Minister Benjamin Netanyahu on Saturday told Israelis there was no shame in asking for all this help, and said every Israeli’s heart should be warmed by the “willingness” and the “immediacy” of the desire by so many nations to lend a helping hand. While the worst of the fire may be behind us, Israel is now starting to realize just how destructive the blaze was. 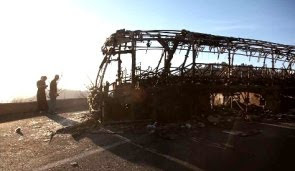 Most tragically, the fire claimed the lives of 42 people, including 36 prison guards whose bus was overwhelmed by the rapidly expanding fire on its first day. The guards were en route to a local prison that was being threatened by the fire and needed to be evacuated. The fire also destroyed portions of a number of local villages and kibbutzim, and many families that were evacuated returned to find they had nothing left. More than 15,000 Israelis had to be evacuated from the area over the weekend. Lastly, the Jewish National Fund reported that the fire had destroyed 12,000 acres of forest, just under half of the entire Carmel forest reserve. JNF officials said it would take decades to rehabilitate the area.